The TRUTH is only one step away. Good experience, love the place... Good and friendly staffs... Will definitely go back. Really good attitude to treat customers, I like it. It's a good place for team building and very fun!! The staffs are friendly and nice. We enjoyed it very much..though most of the times we asked for hints. The staffs are very friendly & helpful. My son & niece loved the most. Will be back soon for other rooms. I like the way that they treat(layan) us and it was the most fun place I had been. 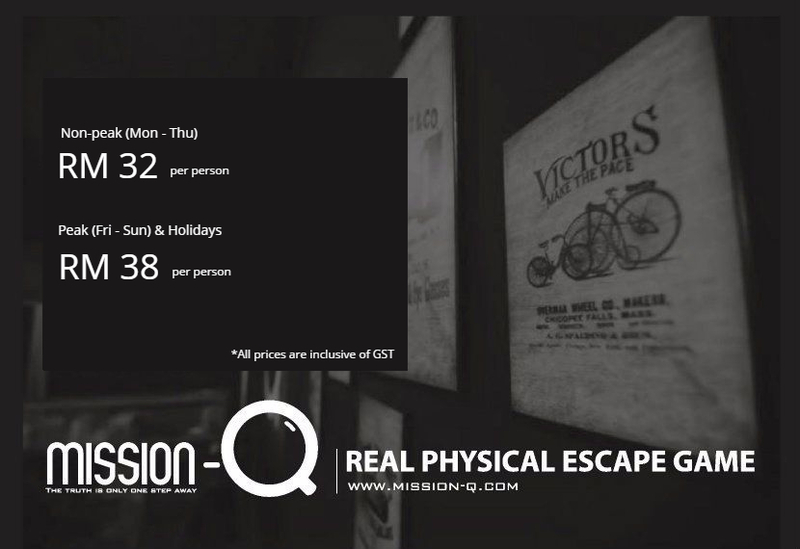 Mission-Q (Real Escape Game Room in Malaysia) brings you 5 unique adventurous escape rooms, each with its own theme. The objective is to physically escape from the room within an hour by collecting items, identifying clues, and solving puzzles and riddles. This game requires observation, teamwork, creativity, communication, and courage. Due to safety reasons, the entrance will remain unlocked. During the game, we rely on your sportsmanship to not to escape via the entrance. Doors with green "Exit" signs are emergency exits only. They are not part of the game. Your personal belongings such as mobile phones, keys, bags, papers, books, pens, pencils, laptops, recorders, cameras, food and beverages, etc. shall be kept at our designated lockers before entering the game room. Our dedicated Game Master will give you a brief introduction before the game begins. Please arrive 15 minutes before your session for these instructions. For late comers, we may only accommodate your playing time until the designated session ends. Keep in mind that the safety factors have been taken into consideration when designing the escape routes. This is an intellectual game - so if your idea for solving a particular puzzle or unlocking a door involves any stunts, brute force, or any actions that may put you or your teammates in danger (such as roof climbing, breaking doors...), you are definitely on the wrong track! Some clues are meant for later stages of the game. Move on if you are not sure how to use a clue, come back to it when you have gathered more clues. Description: As a police detective, you've heard of the cold case of the missing organs that seems to keep recurring with every murder - the victims always end up with their throats slit, eyes bruised, and always with their heart missing. There's only one item that links these murders together, the victim always gets a sketch of a human heart. You think it may be witchcraft, but when your nephew, Charlie whom you've just reunited with after 10 years, suddenly goes missing again - and you discover the same sketch of a human heart in his bag, you know that you have to pick up the case even though you weren't assign to it. Together with your friends, you are going to race against time and proper procedures to solve this case, and save your nephew. Description: With a group of friends, you stumbled upon an isolated cabin that located right in the middle of a thick, green forest. You enter to see a cozy interior. It looks well-lived in but something just doesn't feel right- there's a chill down your spine as you suddenly hear muted knocking sound of hard wood. Sounds as if someone is at the door but there isn't anyone. A stench that smells like corpses reached your nostrils and your gaze forced onto a photo frame by the table. The knocking sounds get louder now. Maybe it isn't the door. Maybe it's the wooden cane belonging to the resident but here you wonder- where is everyone? Description: As a knight, no honor is greater than to be in possession of the Great Excalibur. The Queen has promised you these FOUR coveted swords will to you- if you save her only son, the prince and soon-to-be King Arthur. He has been held hostage in his own castle and the rest of the knights have been killed in their attempt to save him. In your desire for honor and pride, you take up this mission to save the future King of Camelot and to gain the Excalibur. Remarks: Are you the next Indiana Jones? Description: Racing through the sands of time in hopes of escaping the clutches of Anubis, the jackal-God of mummification. An excursion for gold and treasure that overwhelms the desires of mankind turns away when you find yourself trapped in tomb of life and death. Description: A tomb hidden deep in the heart of China is rumored to be haunted by their first emperor, Qin Shi Huang who was buried there alongside his wealth, army, and slaves. His spirit roams through the halls to protect all that he has left and will banish anyone who trespasses into eternal damnation.